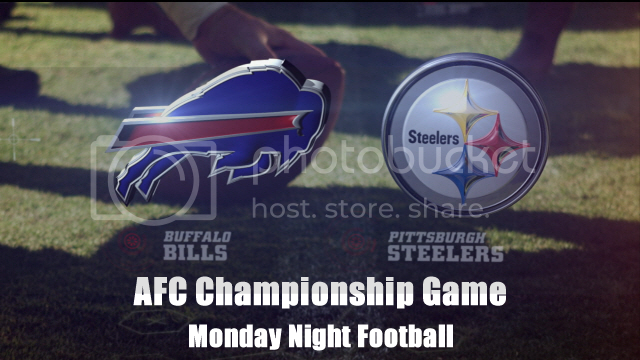 In a special edition of Monday Night Football, the PFL will schedule the AFC Championship game in Pittsburgh, Pennsylvania on Monday night. The Steelers, coached by Michael Ryan, look to get back to their 3rd PFL Bowl in the past 6 seasons. The Steelers have been a dominant force in the AFC having won the division each and every year and in this being their 4th AFC Conference Championship appearance in that time. However, in order to make it to their 3rd PFL Bowl, they will have to go through a Bills team that upset the Steelers in last season's Wild Card Round preventing them at a chance of repeating. Although they are the 5th seed at 10-6, many have forgotten that the Bills are the defending PFL Bowl Champions. After PFL Bowl winning Coach Corey Ward unexpectedly retired after last season, Coach John Whalen came out of retirement to lead the Bills this season. After taking a hiatus from his previous job with the New Orleans Saints, where he took them to 3 straight NFC Conference Championship games and the only PFL coach to win back to back PFL Bowls, Coach Whalen is looking to add to his Hall of Fame credentials by becoming the first coach to take 2 different teams in different Conferences to the PFL Bowl. The defending PFL Champions versus the perennial AFC Champions will battle it out on Monday. The Bills are hot having destroyed the #2 seeded Titans in the Divisional round and the Steelers are looking for revenge for last season's painful Wildcard loss. Both these teams met in week 12 with the Steelers winning by 7. Will history repeat itself? Which of these legendary coaches will make history? Coach Ryan's Steelers making it to a 3rd PFL Bowl or Coach Whalen defending the Bills title by making it to his 3rd?